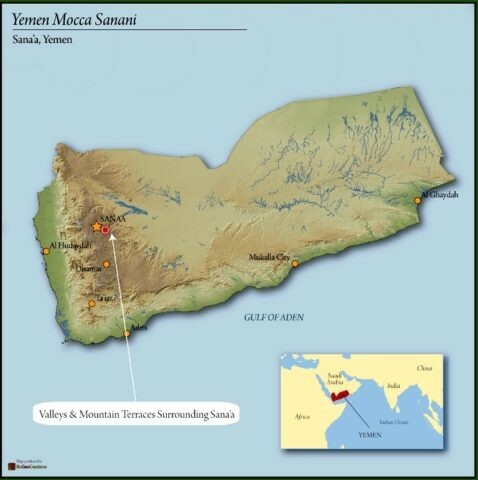 Yemen Mocca Sanani - medium roast, notes of baker's chocolate, bread pudding, teak, and vanilla. Yemen is a country rich in coffee tradition which began over 2,000 years ago, as well as home to the world’s first commercially grown coffee. Today, production is much the same as in the 15th century. The coffee is mostly grown on very small plots. The dried cherry husk, once removed from the coffee, is more valuable in Yemen than the bean is. The husks are infused and mixed with spices to brew a very popular tea. The Ministry of Agriculture and Irrigation was established in 1962 and is well equipped with several Departments, one of which is the ''General Department of Plant Production,” also known as the Coffee Division. Qualified, experienced agronomists who studied and graduated abroad work in this division. The agronomists visit the farmers and give them lectures with projected pictures, movies, posters, etc. They maintain search stations for controlling and combating any pests or plant diseases.